Location Friendly family run hotel, 50m from Kamari beach, just outside a bus stop, 6km from the airport. Facilities Reception, safe boxes (free), breakfast area, terrace cocktail bar, TV lounge, baby cot (free), parking. Rooms All 40 rooms offer shower, hairdryer, safe box, TV, A/C, telephone, music, mini fridge, Wi-Fi internet, the most with balcony or terrace. 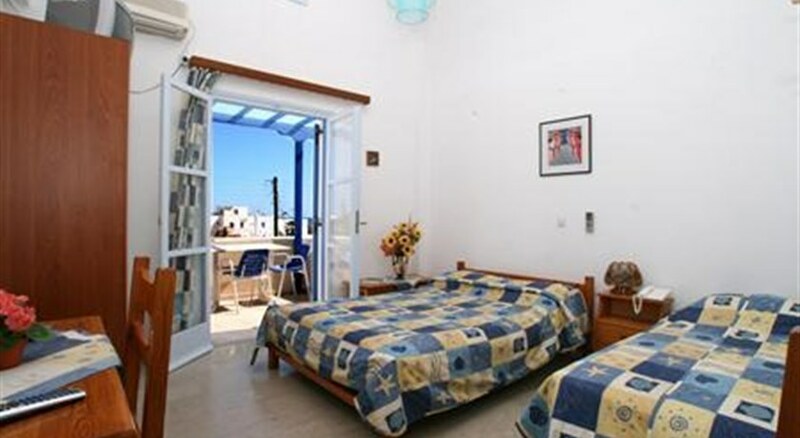 * Studios : 70mtr from the main building - plus kitchenette & private veranda/balcony. Meals Breakfast : Continental / Buffet Payments Credit Cards : Visa, Diners, MasterCard.